We offer hydro jetting services to UNCLOG all those IMPOSSIBLE drains!! When regular snaking or low pressurized jetting doesn’t do the trick, we bring in the BIG GUNS. Both carefully crafted and designed cabling equipment complete with specialty nozzles, along with 4,000 PSI worth of high pressure jetting capabilities! When you’ve got drains that may have been infiltrated by hair, soap scum, soils, tree roots, grease, fats, or even ice build-up, we have the HIGH PRESSURE ADVANTAGE of clearing it out! For your hydro jetting needs, we stand by the quality of our equipment, professionalism and overall level of expertise! Trying to decide if this service could benefit you? We offer both residential and commercial jetting! If you’re a commercial location and you’re not sure, here are a few you’d find most commonly in need of what we do! Restaurants, food service, grocery stores, industrial parks, hotels, office buildings, food processing plants, government offices or buildings, manufacturing, and strip mall type properties where drains are often shared. Not only is this helpful for clearing out a major problem, it’s also helpful when done preventatively as a form of regular maintenance. If you can keep your drain systems flowing the way they’re supposed to be using a high-pressure water jetting approach, you’ll avoid those MAJOR problems they can turn into! Did you know? If snaking is just not getting the job done, we offer jetting services even for residential properties so long as your pipes can handle all that pressure! Ask your Clog Dawg specialist if jetting is right for you! 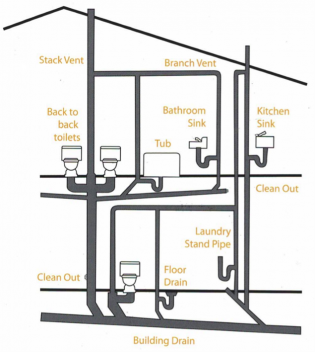 Curious to see how your drains are laid out and tend to function? Check out the graphic! Just like any of the commercial locations, constant drain problems may be occurring, and jetting can benefit your property all the same! And for some smell-good power, try out 3n1 Total-C! Is this for you? Are you one of the following, restaurants, food service, grocery stores, industrial parks, hotels, office buildings, food processing plants, government offices or buildings, manufacturing, and strip mall type properties where drains are often shared. If so, COMMERCIAL DRAIN CLEANING IS for you. Let’s go ahead and review just what it is again. It’s SIMPLE. 4,000 PSI worth of high pressure jetting capabilities! When you’ve got drains that may have been infiltrated by hair, soap scum, soils, tree roots, grease, fats, or even ice build-up, we have the HIGH PRESSURE ADVANTAGE of clearing it out! Think about just how much SLUDGE & DEBRIS and HARDENED SCALE you might have in there. Why is it SO effective? When it comes to solid obstructions cable machines are going to be best, think tree roots for example. When it comes to other softer blockages such as grease, soaps, scales and soils, the water jet machine is the way to go with its state of the art pumps and flexible hoses with specialized nozzles. Do you want a solution to regular build up and slow-downs? What we offer is a way to really stay on top of things by scheduling what we call Preventative Maintenance, or routine, tender-loving care for those hard-working pipes! If you fall into any of the following categories, you may want to check this out! Why is this a grand idea you may ask? A lot of individuals or businesses ONLY reach out when it becomes a major problem, and if you’re one of those places that really requires functionality of your drains (and let’s be honest who doesn’t) you’ve probably started to lose money if you haven’t already! Sure, Clog Dawg Jett can come out the one time to get you right, but why not set something up so you know you won’t end up in this EXACT SAME mess of a position just a few months down the line. As a business owner, you’ve got to think to yourself, “Work smarter, not harder”, ESPECIALLY when it’s YOUR money, YOUR business and YOUR reputation on the line! We offer a variety of contracts as well as pricing. These contracts range from quarterly, bi-annually and even annually, custom tailored to only what you need! Ask an expert from Clog Dawg what might be right for you and your drains. Save yourself the headache. Total-C is a water-soluble formulation, containing ingredients that produce a pleasant, fresh citrus scent, which eliminates the source of the odors and keeps your drains smelling fresh! Total-C combines all-natural citrus based liquefiers and active enzymes with natural oil eating bacteria to instantly emulsify grease, oils and fats without the use of harsh acids, alkaline or solvents. It is an exclusive formula specifically designed to keep your drains flowing free & smelling fresh! Only $49.95 a bottle and it could last you all the way to 6 months or more with regular use! Have an Atlanta plumbing problem? Call (404) 998-1967 today!